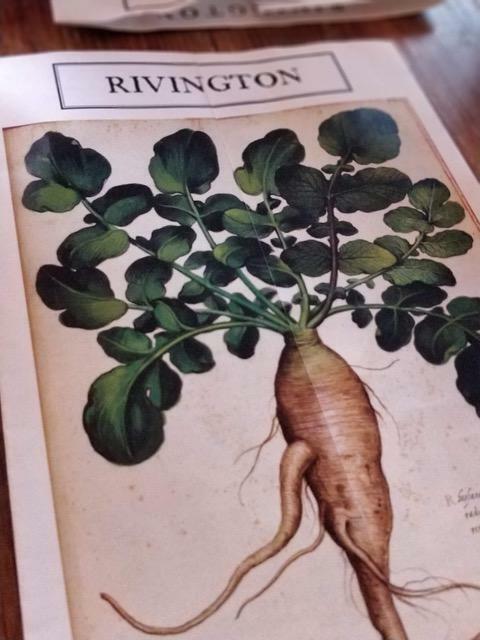 Rivington Greenwich has been part of the community and Greenwich dining scene since 2006. British comfort food and an impressive list of Gins and cocktails feature in a simple but concise menu. We visited Rivington on a Sunday night. Being part of the Caprice Group (see The Ivy, Le Caprice, Harry’s Bar etc), we expected classic British dishes with a modern twist. Upon arrival, I was greeted almost immediately by a member of staff and was asked to take a seat at the bar whilst our table was getting ready. The bartender swiftly acknowledged me and asked if I wished to order drinks. Since my co-diner was on the way I chose to order my drink when we were at the table and not at the bar so he offered me some cold water, which was well received. In the meantime I was enjoying the beautiful live music by Simone Craddock, a fabulous jazz singer and by Robin Banerjee, a talented guitarist. Our very friendly waitress took us to our table and she allowed some time for us to choose our drinks, which I always find so courteous. We both loved the fact that she was very friendly and her suggestions were actually on point. 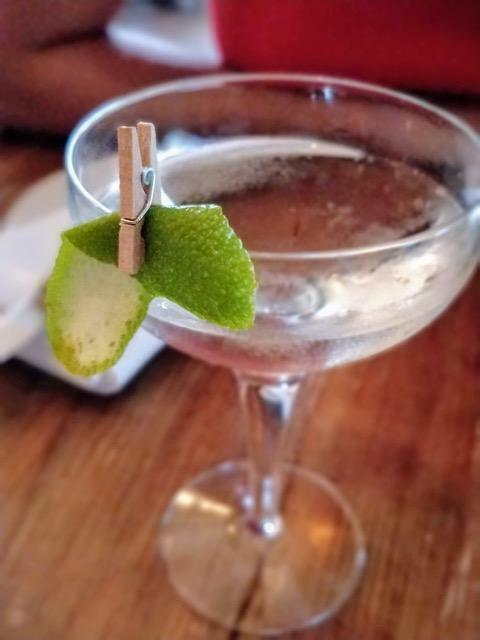 Our cocktails were exactly what we asked for and although we never tried neither of them before we were impressed that they matched our taste and what we asked for. 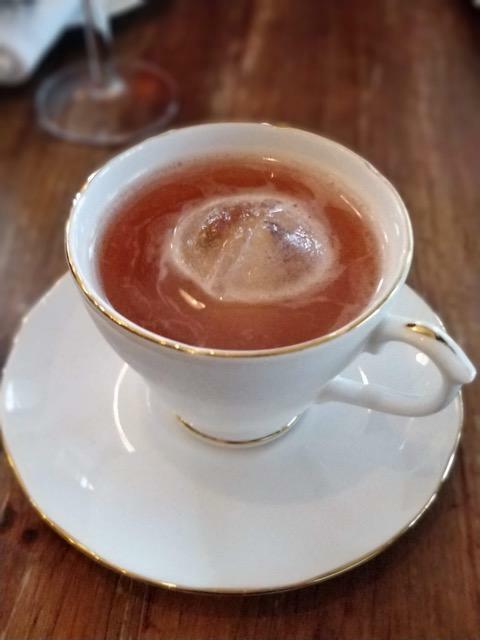 Their drinks menu has possibly the best variety in Greenwich and the cocktails were well presented and executed. They do after all, pride themselves in their gin collection, with a total of 215 labels and rightful so. Also, they currently run Gin O’Clock (every weekday 5-7pm) when they offer G&Ts for £6 and each month you can try a different gin. The menu is simple and not overcrowded with endless pages of mains and starters. A clean cut menu generally offers a sense of comfort to a diner, that doesn’t have to flick through a big menu. And Rivington does offer that familiarity and comfort. For my starter I chose the Burrata and Heirloom tomatoes salad, with rocket leaves and a basil dressing and my dining companion ordered the Smoked salmon with a beetroot and horseradish remoulade. Both plates arrived in a timely manner, with a clean and simple presentation. 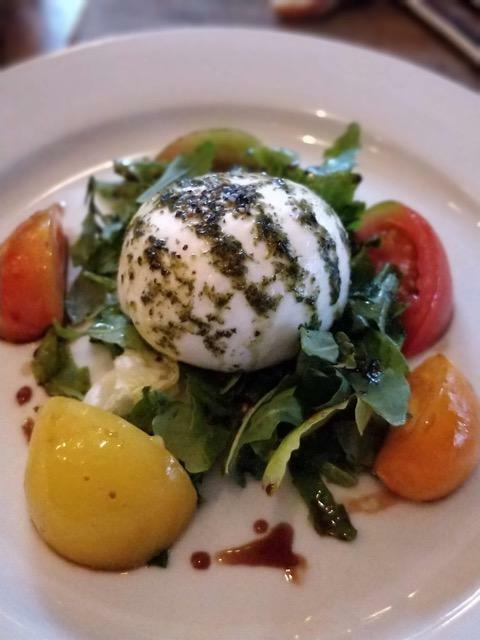 My burrata was fresh and creamy but my tomatoes were lacking that punchy taste of the heirloom tomatoes, that you find especially this time of the year. I was hoping for more sweetness from the tomatoes and more flavour. 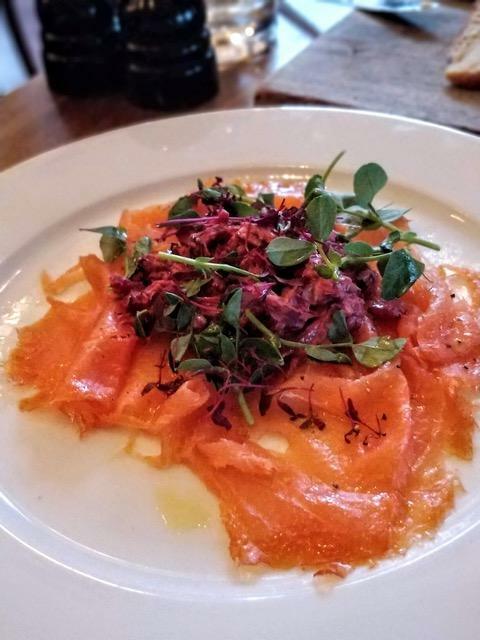 The salmon was a lovely plate of layered wafer thin slices of fish with a delicate beetroot remoulade. We were both happy that we ordered some bread before our starters, as it did accompany both dishes quite well. Especially the salmon would have benefited from a couple of thin slices of bread. As we finished our starters, and our table was cleared for our mains, we were both left with no drinks and felt that a further order was somehow neglected. Our waitress though appeared just in time, minutes before our mains arrived and her wine recommendations again ticked all the boxes. I do love a waiter/waitress with an opinion and she definitely had one, and she seemed to know the food and the drinks quite well. It is so reassuring to know that the person that is looking after you, knows the menu well. Moving on to the mains and my companion wanted the rack of lamb, but sadly they did run out of that dish that evening, so she had to order the sirloin steak instead. 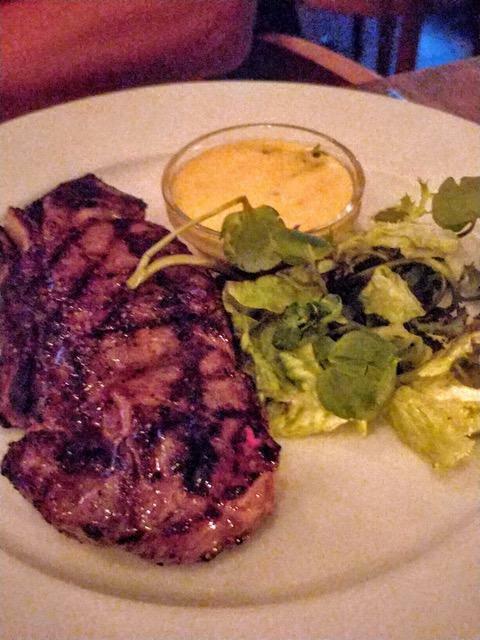 Although not a big fan of steak, as so many times restaurants fail to cook it to taste, my friend was not disappointed on this occasion. The steak came perfectly cooked medium rare with the distinctive charred markings on. She substituted the chips with spinach. The spinach on the other hand was a bland lump of steamed leaves that lacked any seasoning and she had to leave that uneaten. The side salad could have done with a light dressing too. My main was a classic British dish but with a seaside twist. A monkfish and prawn masala, with coconut rice. The masala is a classic in UK curry houses and a total invention of the British. My fish and prawns were juicy and well cooked, but the sauce lacked the distinctive creaminess of a masala. The ration of monkfish and prawns was very well balanced with the sauce. The vegetables in the sauce were al-dente to almost undercooked. My rice was not what I expected, a steamy coconut infused bowl of basmati. It was long grain rice with the coconut flavour almost non existent. Overall my main was somehow disheartening as I hoped for a nice creamy curry and a delightfully aromatic rice and got none of that. Despite that, my wine was the perfect match for a seafood curry. Light and fresh with very delicate tones. Time for dessert and we both chose desserts that honour any British menu! Strawberries and cream and a gooseberry, elderflower crumble with fresh custard. Seasonal and classic. 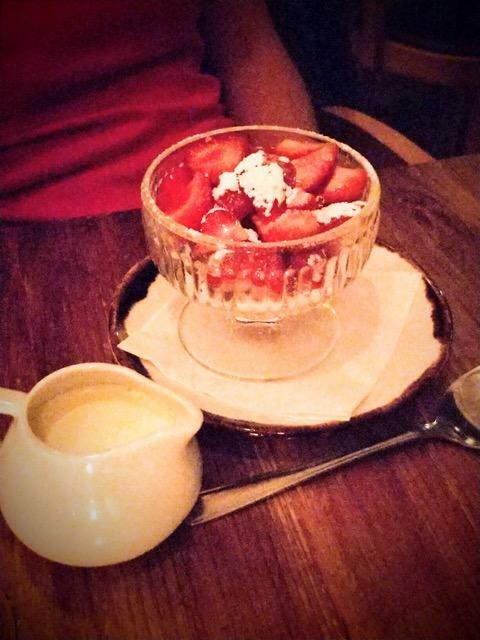 The little bowl of strawberries came with a dusting of icing sugar and mini jug of cream, but it was just about it with a plain bowl of regularly tasting strawberries. 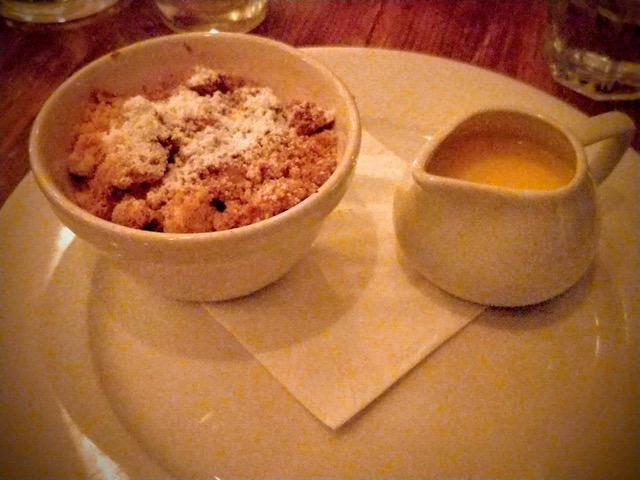 My crumble also came with a mini jug of a rather thin custard with the texture more of double cream. The gooseberries were beautifully sharp and they were nice and soft inside but still with that lovely crunch of their skin. The delicate elderflower was completely lost in the crumble which I felt was overpowered with the taste of the crumble that was slightly burnt on some parts. The burnt crumble bits sadly masked the rest of the flavours. Overall we had a lovely evening. The vibe in the restaurant was really nice and the decor is light and airy, since half of the restaurant boasts high ceilings. The live music did definitely add to the atmosphere, despite the fact that it was quite loud and we did have to speak rather loudly to hear each other as we were pretty much next to the singer. The food on the other hand, left both of us a bit underwhelmed. The menu is simple and that is wonderful, but a bit more care and thought on presentation and flavours would have made things better. With restaurant prices you would expect more than what we were presented with that night. 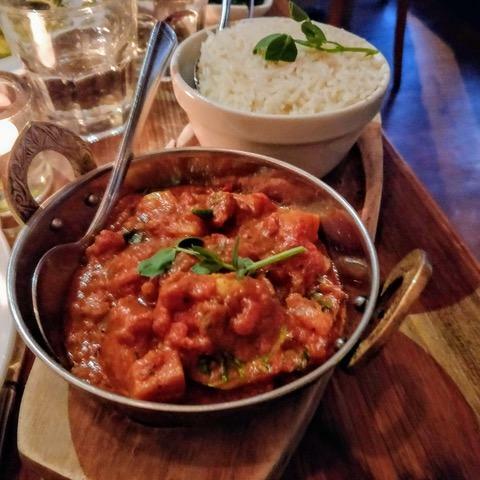 We were very happy with the service as they were constantly responsive to all the diners that night and particularly pleased with the knowledge our waitress had. Always served with a smile! Since Rivington changes their menu quite frequently I do hope to see more exciting dishes and better delivered in the months to come. Disclaimer: We were guests of Rivington Greenwich. This is not a paid partnership and this review is based on my own and honest opinion.